Clearly, while adding some users as Windows Administrators, not only do we do that, but also we add them as Administrator of Analysis Services (SSAS). So, if we delete them from Windows then they will become orphaned users inside SSAS. As a result of this action, not surprisingly, we are going to get the following error when we are trying to add other users to the server administrator role in SSAS via the GUI or by code. 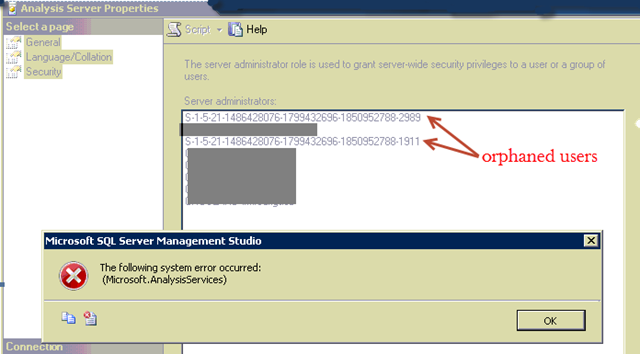 This sort of error is raised at times as the orphaned users have not got a correct matching inside the Active Directory. So, only their invalid user IDs will still be registered. What we should do to fix this issue and be able to add other users is, firstly, to remove these orphaned users and, finally, add the new ones. I hope you find this short post interesting. Thanks for reading!